I park my car in the Curry Village lot; it’s huge, with spaces for several hundred cars, though it isn’t paved. It takes me a few minutes to get situated. 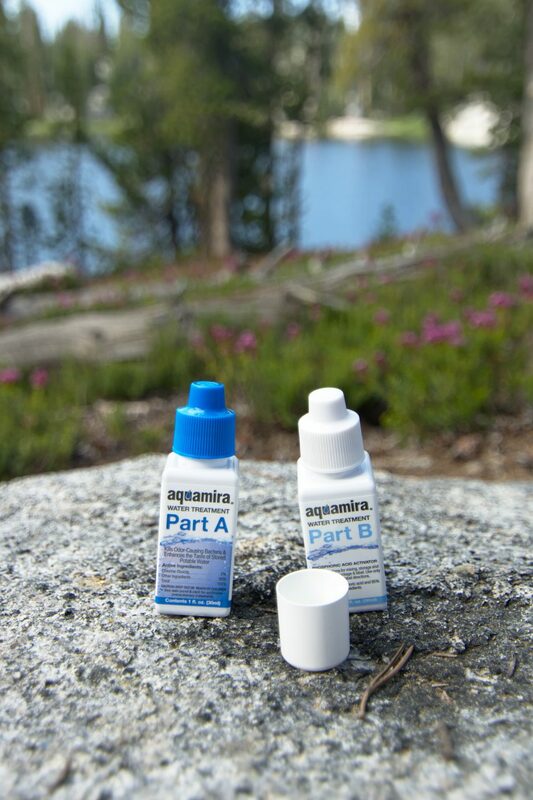 Everything I need for my backpacking trip needs to go to the backpacker’s campground near the North Pines campground. Any scented items that I’m not eating tonight or tomorrow morning have to go in a bear box near the parking lot; bears have literally torn cars apart to get at food left inside, and I like my car the way it’s shaped right now. Finally, everything that looks remotely like food or a food container (e.g., coolers, bottles) must be moved from the cabin to the trunk (again, bears tearing car doors off…). After some packing gymnastics, I separate my stuff. One bag of food that I’m not eating now goes in a bear box, all my boxes and bottles go in the trunk, and my backpack and some extra food goes with me to the backpacker’s campground. I’m allowed to stay here for one night before my trip and one night after my trip and it’s quite cheap: $6 for a campsite. I have a bagel with peanut butter for dinner, supplemented with apple sauce, a boxed chocolate milk, and a granola bar. The mosquitos are starting to come out, so I find my bug spray in my pack. To my dismay, the bottle seems to have… melted. I’ve read about thi, ; apparently Deet can do this to plastic, but I didn’t expect it to melt its own bottle. I shrug it off and toss the bug spray into a trash can. I can deal with mosquitos; how bad can they be? I’ve only set up my tent once so far, but it’s not difficult and I remember how everything works as I unpack the pieces from my pack. Because of the 4,000+ foot granite cliffs, sunset comes early to the valley. 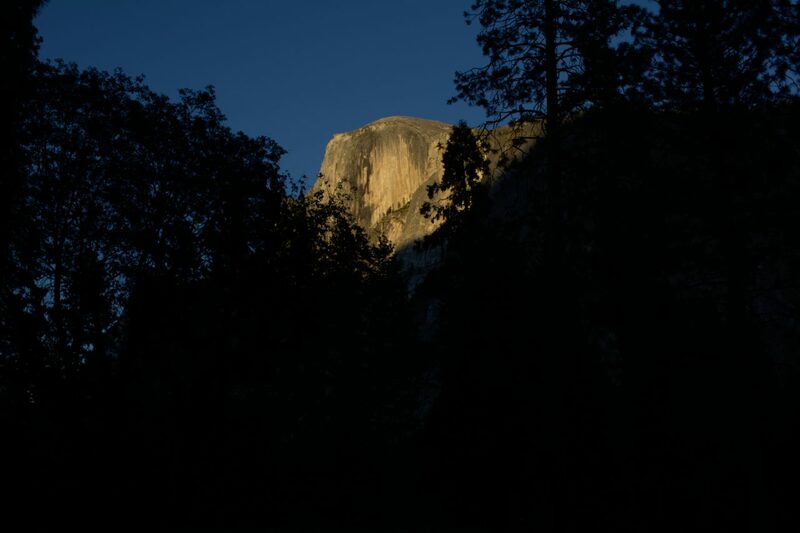 By 8:00, it’s getting dark and the setting sun casts an orange glow on the higher peaks, including Half Dome. I’m really nervous about this trip. I’ve never done a solo backpacking trip before – what if I get lonely? What if I’m bitten by a snake or hurt by some other animal? What if it’s just miserable instead of fun and exciting? I spend a little time writing in my trail journal and then decide the best course of action is to go to sleep. I’ll feel better in the morning. As predicted, the next morning brings happier, more excited feelings. I didn’t sleep incredibly well, probably because I’m used to soft beds, not unyielding dirt and rock through a thin foam pad. I’m up at 4:45 because it’s getting light and I can’t sleep anymore. I have another bagel for breakfast with an apple and a box of apple juice, finishing off the non-backpacking food I brought from my car. By 5:45, my pack is ready to go and I head out. My permit allows me to enter the wilderness from the Happy Isles trailhead and stipulates that I proceed up Illilouette Creek. 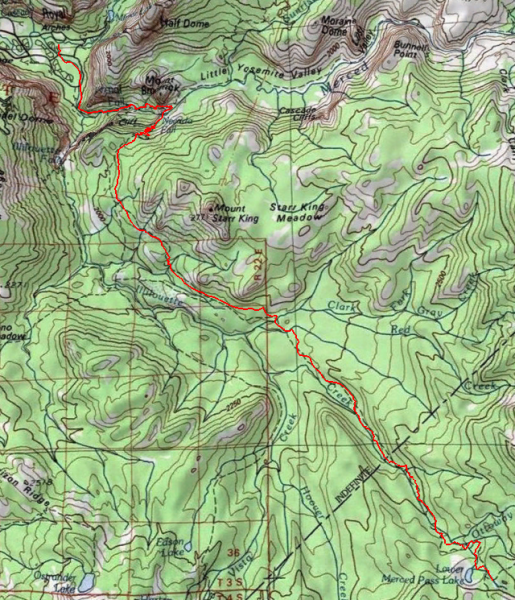 My plan is to camp about 10 miles down the trail; I figure 10 miles is plenty far for my first day, especially because I have to climb several thousand feet in the first few miles to escape the crowded valley. 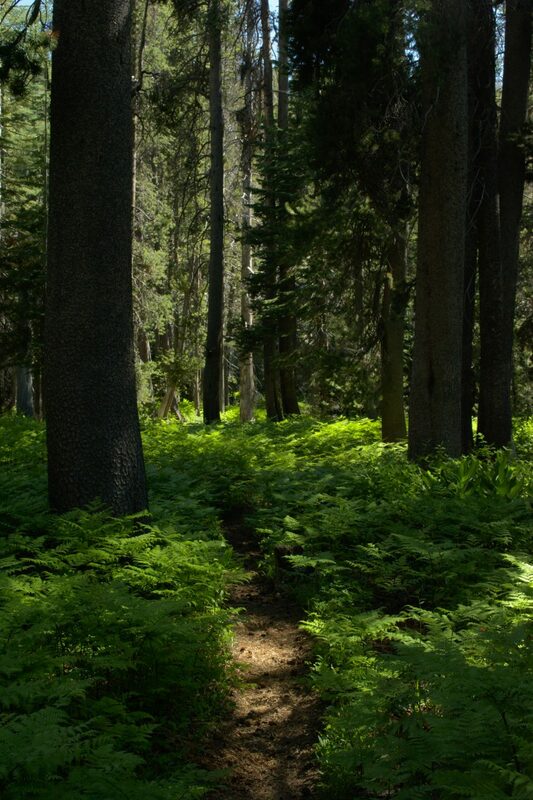 It’s about a mile walk from my campsite to the Happy Isles Trailhead, and I arrive at about 6 AM. Despite being up really early, I’m not the only person heading up the trail. I pass and am passed by several small groups as I hike. However, as I’ll later learn, the trails are relatively empty compared to what they will be later in the day. Leaving early has other advantages: the air is cool, and the light is excellent for photos. There are some great photo ops in the first few miles, too. Vernal Falls greets me after one or two miles of hiking. It’s impressive, and the mist that blows down the canyon feels nice. This trail, the “Mist Trail,” mostly consists of steep stairs. 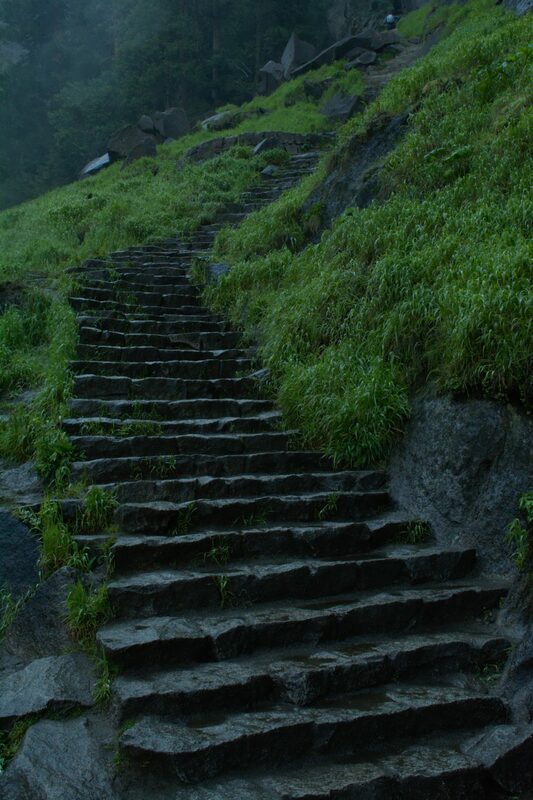 Some are flat and easy to climb, others are made of stones gathered from the area and are more difficult to navigate. Water from the nearby falls is the reason for the name – it’s very damp! 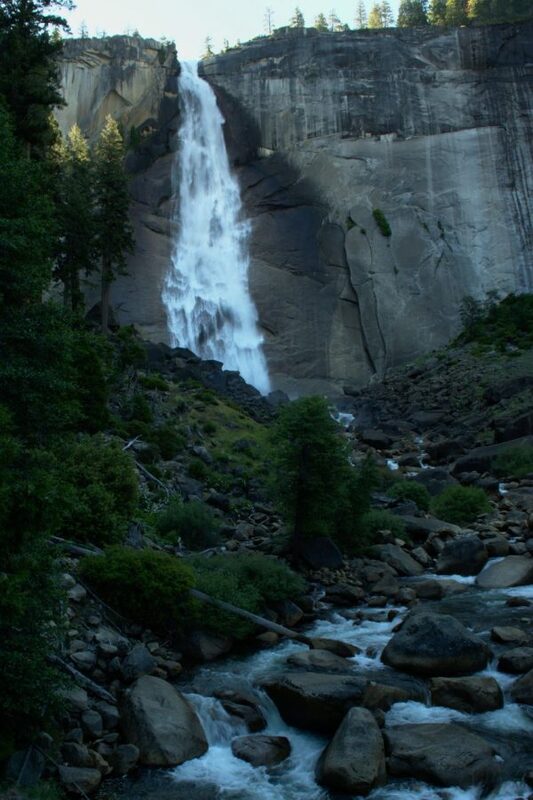 After a stretch of climbing, I reach Nevada Falls, which looks significantly taller than Vernal Falls. I stop to take a few more photos, but try not to tarry too long; it’s only getting warmer outside and I still have a long way to go. 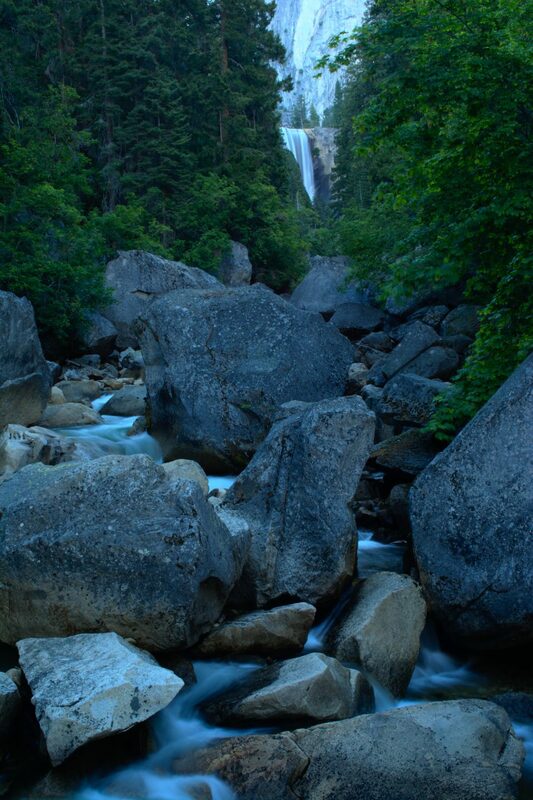 Although Nevada Falls’ height makes it an impressive waterfall, it also means I have to make my way to the top… The nice, rectangular steps from the lower Mist Trail have long since disappeared and are replaced entirely with a cobblestone-like trail. I don’t feel too bad about my frequent breaks to catch my breath because all the other people hiking this trail are doing the same thing. In fact, I’m hiking more quickly than most of them, so that boosts my confidence a little. Running muscles FTW. By 9:00, I’ve reached the top of Nevada Falls (roughly 2,000 feet above the valley floor) and split from the Mist Trail and/or John Muir Trail. 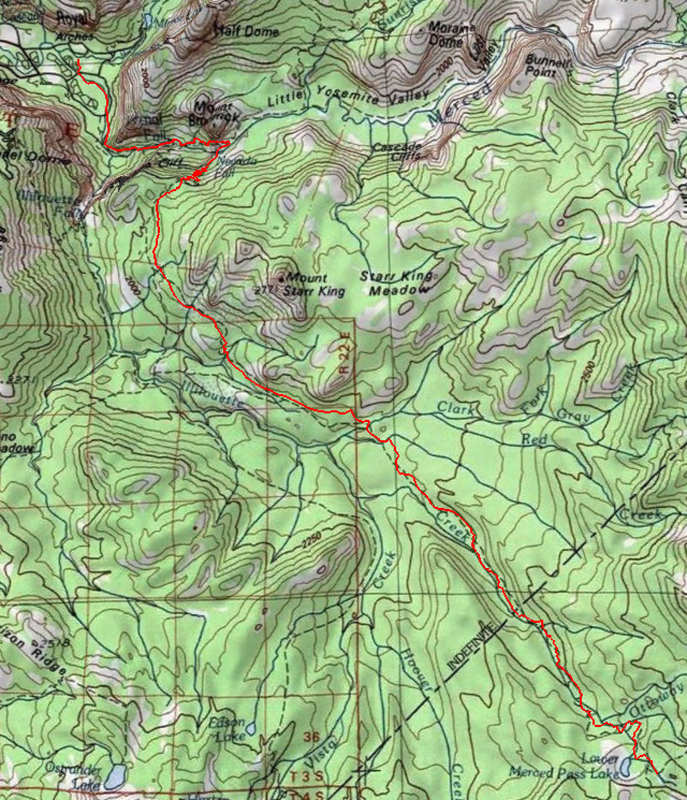 I head South, towards Illilouette Creek instead of Little Yosemite Valley. Up to this point, I’ve constantly been in sight of at least one other person. As soon as I leave the JMT, the number of people drops to nearly zero. It’s kind of nice – it’s quieter without all the hikers. This trail is less steep, too, although it keeps ascending for a while. I talk to myself as I go, commenting on the scenery or the constant ascent. My goal is to make sure I don’t surprise any animals: bears, or snakes. After another half an hour of switchbacks, I reach what seems to be a plateau and a trail crossroads. Two women hiking from Glacier Point startle me and ask for directions to Nevada Falls. I point them in the direction I came from; these are the first people I’ve seen since I left the Mist Trail. I pull my map from one of the many pockets in my cargo pants and check to make sure I’m going the right way and then head down one branch of the trail. I’m right: it does remain at about the same altitude for a while. There are fewer trees up here and therefore less shade. A mile down the trail I realize that I only have one bottle with water in it. The map shows a few small creeks along the way, but when I reach where I think the first one should be, I discover that it has dried up. I probably should have refilled my bottles at the top of Nevada Falls, but the thought didn’t occur to me at that point… oh well. Nothing to do but continue forward. I hike another hour before I find a viable water source. It isn’t much, just a small stream of water trickling down over rocks, but it is welcome. I drink all the remaining water and then refill the bottle from the small brook. 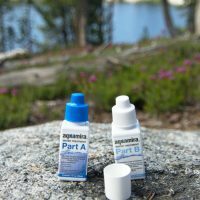 To treat the water in my one-quart bottle, I pour seven drops of Part A into a small cap and then add seven drops of Part B. I let it sit in the cap for five minutes (having a stopwatch is very helpful!) before pouring it into the bottle of water. A good maraca beat with the water bottle mixes it up, but I have to wait at least 15 minutes before drinking it. The instructions say “30 minutes for cold water,” so I figure I’ll let it sit the full half hour. I continue on my way, feeling a little better now that I have water again. The trail here is difficult to follow, though. The bushes that line the path are overgrown and sometimes obscure the trail completely. It doesn’t seem like a very popular route, and there isn’t much shade; all the trees seem to have burned down recently. There are still a few charred trunks standing. Time for a break; not pictured: stinky feet. After walking for a while, I finally reach tree cover. The respite from the hot sun is very welcome, and my mood improves considerably. To make matters even better, I soon come across a legitimate stream! 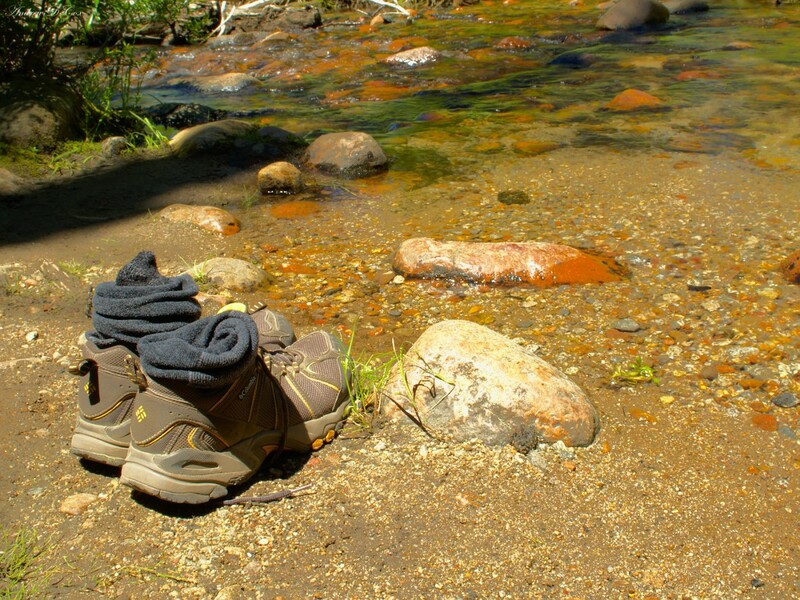 It’s high time to take a break, so I take off my shoes, purify some water from the stream, and soak my feet. 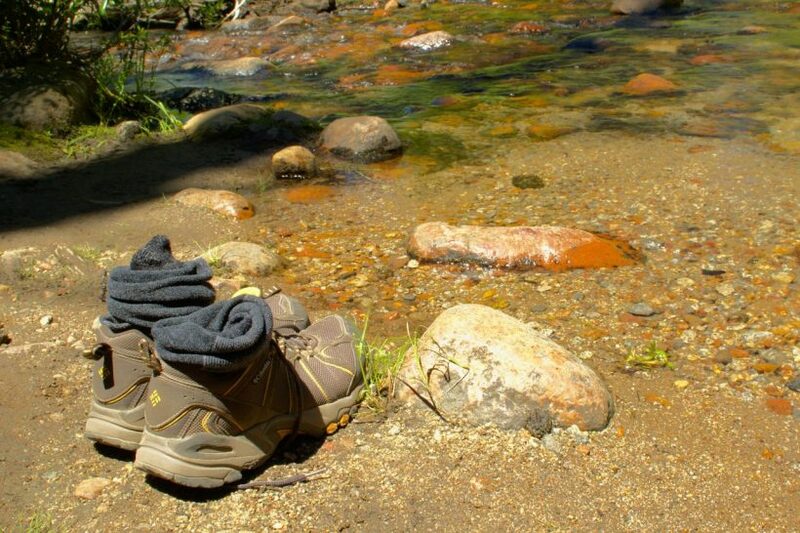 The cold water feels fantastic running over my feet, but they soon begin to go numb (the water is really cold) so I step out and put my shoes back on. I walk for another half an hour, now in a great mood, and stop for lunch at about noon underneath some very tall trees. I brought a block of cheddar cheese to have with crackers and jerky. The cheese is a little melty around the edges, but it smells fine and the middle is quite solid. I would never think to eat this as a meal at home, but crackers, cheese, and jerky turn out to be a very filling lunch on the trail. I force myself to eat all the crackers (I don’t want to carry them!) and then continue on my way. 30 minutes later, I meet the first human being I’ve seen in several hours. He’s walking at a comfortable face, and it looks like he has mud on his face to serve as sunscreen. I say hello and then continue on my way. Not much later, I discover that my sleeping pad has fallen off my back. I backtrack for half an hour before I find it – it’s right where I ate lunch. I take care to reattach the pad more securely this time and then head back the way I was going. 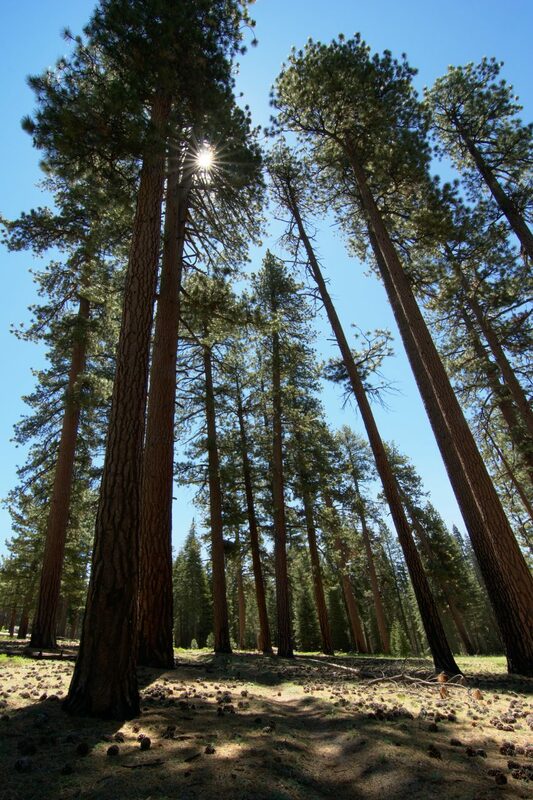 The landscape is different here; the tall trees are no longer surrounded by pine cones and needles. I must be near water because there is an enormous amount of lush, green brush and there’s even some grass! The greenery is a welcome change from the dry, brown scenery I’ve been walking through. I meet a woman and stop to chat with her for a minute. She’s looking at me strangely and asks me if I’m a plant researcher; she thinks I look familiar. I tell her I’m not, I research quite the opposite: spaceships. 😀 Perhaps she knows my brother, who is studying plant science and doing related research at Utah State University. 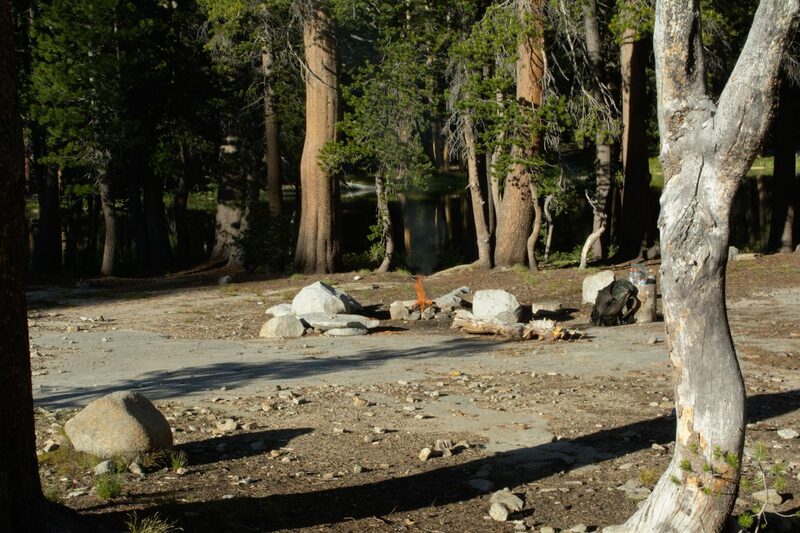 Choose a campsite with a durable surface (i.e. not on top of plants, even grass) at least 100 feet from any water source or trail. Cary out all trash. Do not burn or bury toilet paper or trash. All human waste must be buried at least 6 inches deep and at least 100 feet from water, camp areas, and trails. Proper food storage is mandatory. All food and scented items must be placed in an approved bear-resistant canister. Hanging or guarding food items is not permissible. I decide to aim for Lower Merced Pass Lake. It looks large on my map and I’m sure I can find a place to camp somewhere nearby. It’s another four or five miles down the trail, but I have several hours before I want to stop. The trail keeps going up and up, and I tell myself every peak is “the last one” before I find my lake. Of course, that isn’t the case and I go through the cycle several times. At 5:00, I reach a crossroads. Two young men are standing there chatting. I toss my pack down and join their conversation for a few minutes. My grouchy mood slowly fades as I talk with them. They began their trek at Glacier Point two days ago, which means I just did their two-day hike in one day. Perhaps I really should have stopped earlier. They’ve been here before and tell me I missed Lower Merced Pass Lake. The three of us walk a few steps up the trail sans packs (you feel like you’re floating once you take the pack off!) and they show me the lake way below us. Luckily for me, Upper Merced Pass Lake is very close and won’t require me to backtrack. My new friends say farewell after that and head off to Lower Ottoway Lake. Now that I’ve made it to a campsite, I’m feeling a little better. Mentally, that is – my legs and feet hurt a lot. 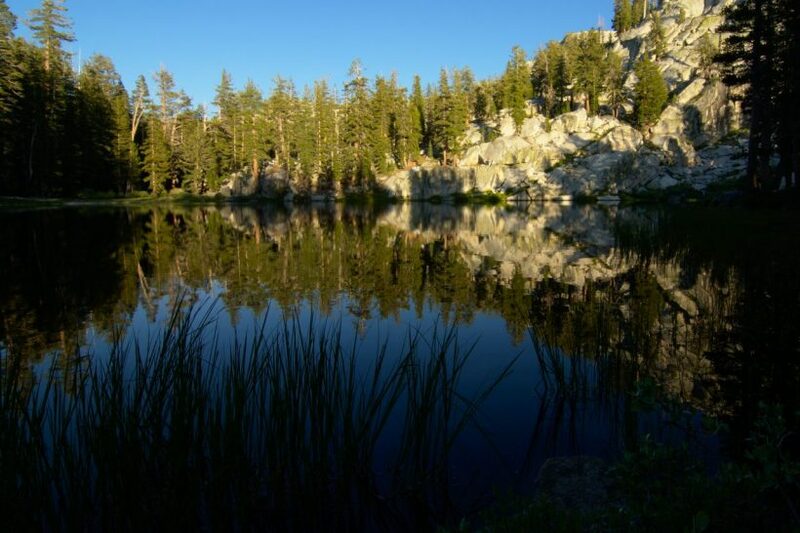 Upper Merced Lake is completely vacant and I have my pick of nice campsites nearby. I find one in a large stone valley next to several pine trees. There are huge glacial erratic boulders scattered around the valley, providing some cool places to stash my bear canister tonight. It’s quiet and peaceful here; there are no cars, no other voices, nothing. Just the wind in the trees, the crickets, and the birds. After a long day of hiking, the serenity of the lake is just what I need. Unfortunately, because a lake is a non-moving body of water, there are plenty of mosquitos. I don’t have a way to keep them off me, so I try to keep moving and set up my tent. I toss in my sleeping pad, sleeping bag, and a few of my warm clothes to serve as a pillow. There is a fire ring not far from my tent, so I decide to make a fire. There is plenty of dead and down wood, so I gather up a variety of sizes and get a fire going; the smoke keeps the mosquitoes away, thank God. I let the fire burn down a little and then spread the coals out and put my little pot on top. The water inside boils quickly, and I pour it into the gallon zip lock bag that contains the couscous and dehydrated veggies. I seal the bag, mix up the contents and then let it sit for 10 minutes so the veggies and couscous can absorb the hot water. My stomach is doing some strange cramping things; I wonder if the cheese I ate this afternoon was bad? It hasn’t been refrigerated in a while… :/ Or perhaps the high altitude is getting to me (I’m at about 9000 feet)? Or I didn’t purify the water well enough? Once those ten minutes are up, I eagerly dig into the bag with my spork. It is delicious! Of course, almost anything tastes good when you’re camping, but it’s a very good meal. Quite filling too! I ate a Cliff bar or two this afternoon, plus my daily Snickers bar, so this is a nice way to top off. After eating, my cramps lessen but my stomach is still uneasy. Using the bathroom helps a bit more. Pooping in the wilderness is always an experience. You dig a hole, squat over it, and let loose. Once you’re done, you wipe up with a few pieces of toilet paper, bury your business, and store the toilet paper in your trash sack. It’s freeing to be able to poop whenever and wherever (almost) you want, but pooping in a hole does make you appreciate the pleasantness of a toilet that you don’t have to dig yourself. I don’t let the fire burn for too long and make sure to thoroughly drown it with water from the lake. I fill both of my bottles and mix the water with purifying droplets so I’ll have clean water tonight and when I wake in the morning. Since the fire and mosquito-banishing smoke are now gone, I escape into my tent and spend some time writing in my trail journal. I’m exhausted and a little worried about my stomach and the bugs. Maybe I’ll cut my trip short by eliminating my visit to Tuolumne Meadows in a few days; I could reduce the length from seven days to four. Speaking of which, I covered about 150% as much ground as I planned on today, so my plan is already ahead of schedule. If I’m reading the map correctly, I walked 16 or 17 miles today and ascended at least 5000 feet. I guess I’ll see how I feel tomorrow. This is my first solo trip, after all. Before falling asleep, I gather a few rocks outside my tent to throw at bears or other critters that decide they want my food and make use of my toilet paper again. I make a pillow out of my sleeping bag stuff sack and my fleece jacket; it’s not as good as a real pillow, but it’s comfy enough. Lying down feels fantastic after a long day of hiking and I quickly fall asleep. Wow. Sounds like quite the emotional and physical rollercoaster. I sure wish I would have been with you, but I wouldn’t have been able to keep up 😉 Thanks so much for sharing your inner thoughts and the details of your trip. I’m glad this story has a happy ending 🙂 Love you!